Squadron Leader William Barfoot featured among a group of officers and senior non-commissioned officers having drinks in the Sergeant’s mess at RAF Castle Bromwich. 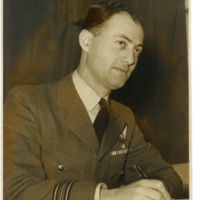 Squadron Leader William Barfoot in dress uniform at RAF Castle Bromwich. He’s wearing a navigator’s brevet and two rows of medal ribbons. A safe is partially visible. 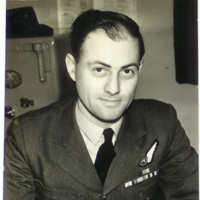 Squadron Leader William Barfoot in dress uniform, sitting at a desk at RAF Castle Bromwich; he wears a navigator’s brevet and two rows of medal ribbons.